When it comes to our nations flag, the exact origin is unknown. However most of us know that seamstress Besty Ross is given the credit by a majority of historians. She is reported to have hand sewn the first flag in 1776, but did you know that it wasn't established as the official flag until more than a year later in June of 1777. 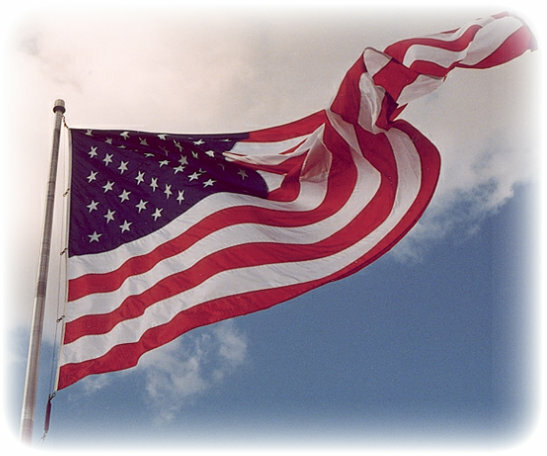 The first official flag had thirteen stripes, and thirteen stars in a field of blue. The stars were said to represent a new constellation. The flag has gone though several changes throughout history. Altering the stripes, the order of the stars, the number of stars and stripes, but the colors have always remained the same. The Continental Congress never actually spoke about what those colors represented. In 1782 the Great Seal of the United States first appeared, and that's when colors where explained. Most historians adapted those meanings for the flag as well: white representing purity and innocence, red - hardiness and valor, and blue representing vigilance and justice. Today's flag has thirteen equal horizontal alternating stripes, seven in red and six in white. There is a blue square with fifty small five-point stars arranged in nine offset horizontal rows of six. Fifty stars represent the fifty states, and the thirteen stripes represent the thirteen original colonies. You might be surprised to learn that a pattern has already been drawn up just in case another state is added...can you imagine a flag with 51 stars? The United States of America's Flag represents so much more than a flying piece of material. Old Glory is a symbol of independence, liberty, pride, hope, patriotism, honor, sacrifice, home, responsibility, and so much more. The flag represents so much that it also has become Americana's signature. I would love to hear from you. Let me know what comes to your mind when you see the Stars and Stripes. I feel bittersweet. I feel happy and grateful to be in this country where we have freedom to worship and speak. But, I also feel that we are losing freedoms and that people are taking America for granted. And that worries me. So, I feel both good and bad when I look at the flag. But, mostly good. Your blog is so fascinating! I, for one, love our flag and what it represents. Our country may have it's share of problems, but just a visit to another country makes one appreciate the USA even more! Thanks so much for visiting my blog. Hope you'll try some of the paint tutorials one day!